Numero Lingo is the easy way to learn to count in a variety of foreign languages: English, French, German, Italian, Portuguese, and Spanish. Even if you are fluent in all other aspects of a language, you may still find it difficult to understand numbers delivered at speed. Numero Lingo is here to teach you to interpret those rapidly-spoken telephone numbers or till totals. ...... A test lasts for the number of minutes you specify, during which you must answer numerical questions displayed in the chosen language. For example, if you were asked to translate the words "five hundred and sixty one", your correct response would be to type "561". 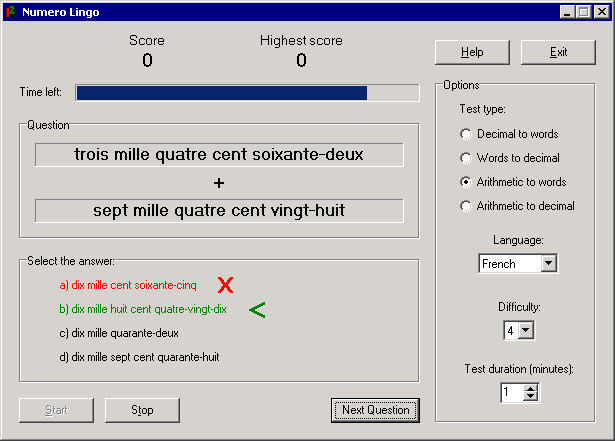 There are four levels of difficulty, corresponding to the maximum number of digits used in the questions. If you are new to a language, you can select the lowest level. Even if you initially have no idea about the correct responses, you will quickly learn the proper translations as your incorrect answers are corrected. Professional numerology software featuring four different numerology systems. Personal numerology software by Matthew Oliver Goodwin. It gives you the complete picture of the numbers that influence your life. Lingo is an intuitive vocabulary training application. Qweas is providing links to Numero Lingo 2.34 as a courtesy, and makes no representations regarding Numero Lingo or any other applications or any information related thereto. Any questions, complaints or claims regarding this application Numero Lingo 2.34 must be directed to the appropriate software vendor. You may click the publisher link of Numero Lingo on the top of this page to get more details about the vendor.